Franklin, 35 @ Holy Name, 33 – Final – Ali Brigham secured the win and a season sweep of Holy Name, scoring the game-winning basket with just one second remaining on the clock. Brigham scored 23 points on the night. Franklin, 2 @ Mansfield, 2 – Final – Click here for a recap and photo gallery of this game. Canton, 3 vs. Newburyport, 1 – Final – Canton faced a one-goal deficit after one period but scored three unanswered goals to beat Newburyport. Junior Colby Ciffolillo knotted the game early in the second period and senior Ryan Nolte scored on the power play to put the Bulldogs up 2-1. Junior Chris Lavoie scored in the third period to make it 3-1. North Attleboro, 2 @ Foxboro, 0 – Final – North Attleboro scored once in the first period and again in the second period to pick up a win over Foxboro. Jake Ebert put the Rocketeers ahead 1-0 and Dennis Morehouse doubled the lead with a goal in the second. 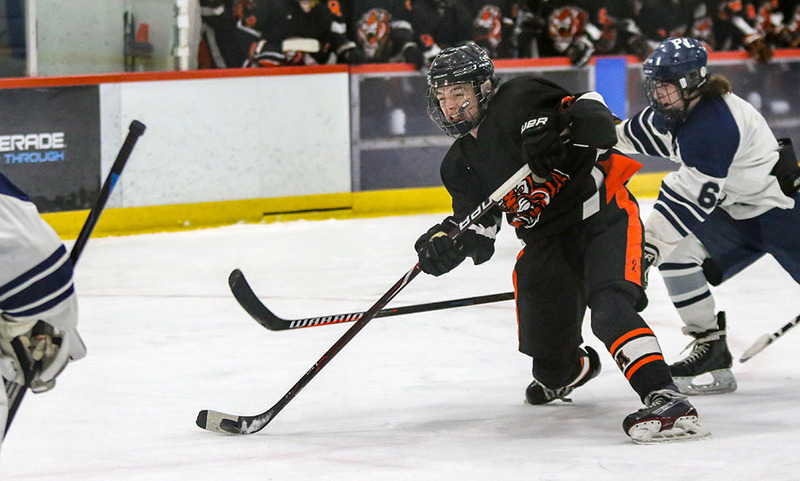 Oliver Ames, 6 vs. Coyle & Cassidy, 1 – Final – Oliver Ames exploded with four goals in the third period to pull away from visiting Coyle & Cassidy. Hunter Costello paced the Tigers with a pair of goals and an assist, Brett Williams scored once and had one helper, and Julian Krowski (first career goal), Duncan Pereira, and Max Ward each scored once. Owen Connor earned the win in net with 19 saves. BROCKTON, Mass. 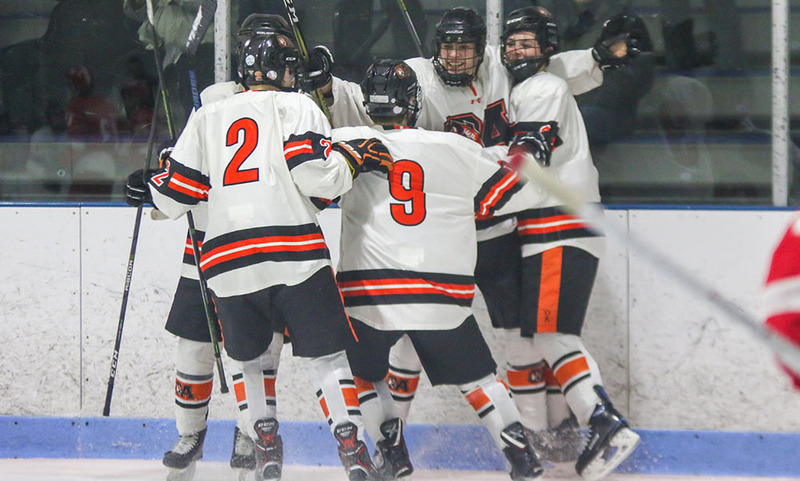 – Win, lose, or tie, there is one thing that Oliver Ames boys hockey coach Sean Bertoni knows about his team: they aren’t going to give up. Trailing by a goal entering the third period, and without two of their top point producers due to injury and illness, the Tigers battled back to score the tying goal midway through the period and killed off a penalty in the final two minutes to grab a 2-2 tie with visiting North Attleboro. Despite being without leading scorers Cullen Gallagher and Brian Kearns, who each have 17 points, the Tigers twice overcame a one-goal deficit in the game. North Attleboro took a 1-0 lead just over five minutes into the game and took that advantage into the locker room during the first intermission. OA knotted the score with 9:50 to go in the second period but the Rocketeers took the lead back with a late goal in the second. Rocketeer senior defenseman Brendan McHugh put the visitors up 2-1 with just 1:03 left in the second period. After skating to a relatively even period, McHugh tossed a high shot on net from the blue line that OA goalie Owen Connor (14 saves) never seemed to get eyes on and it fluttered into the back of the net. The Tigers opened the third by earning a power play but couldn’t muster any chances on goal. Instead, the best chance came for North Attleboro when the penalty expired. Rocketeer junior Jack Connolly came out of the box, took a pass and went flying into the offensive zone alone. But Connolly couldn’t quite get off a final shot with Connor covering the post with the pad. Three minutes later, Oliver Ames had its equalizer. Senior Brett Williams prevented a clearance along the boards with a strong check that put the puck in the center of the ice. Junior Ryan Gottwald was able to bat the puck back to Williams, who was all by himself, and he deposited his shot five-hole to knot the score 2-2 with 6:47 to go. North Attleboro had a final chance to go back on top when it went on the power play with 2:13 to go in the game. Oliver Ames’ top penalty killer Matt McCormick was whistled for a boarding penalty but the Rocketeers were only able to get one shot on net during the final two minutes. Max Ward came up with a big early clear, and then teamed up with Williams to provide an aggressive forecheck that didn’t allow the Rocketeers to leave its own zone. McHugh had the lone shot of the man advantage but Connor easily gloved it. “Even just getting the penalty with two minutes left in a tie game can deflate a team, especially with our top penalty kill guy in the box,” Bertoni said. “But it felt like we were attacking on it, we didn’t let them set up. I think they only had one shot on net, we had a good chance too. Brett and Max were relentless in the offensive zone. The kids are giving us everything, it’s awesome to see. We haven’t got much puck luck this year but hard work will pay off. The Tigers even had a chance to score the game winner while shorthanded. Junior Hunter Costello cleared the puck off the boards and senior Colin Bourne used his speed to get around a North defender and get to the puck first. He was able to get a close bid on goal but North senior goalie Ryan Warren (19 saves) made a big pad save to prevent the shorthanded bid. North Attleboro struck on a rebound chance 5:31 into the contest. Andrew Zammiello put a shot on goal that Connor turned aside but junior Dennis Morehouse had plenty of space in front to bury it into the back of the net for a 1-0 lead. North had a couple of chances to add to its lead in the first but couldn’t find the back of the net. The best opportunity came when Todd Robinson fed Connolly in the slot but Connor came up with a big pad stop. OA’s best chances came off the stick of McCormick, who fired a slap shot that Warren gobbled up and a backhand chance from Jake Gottwald that Warren turned away. OA senior James Beatty set the tying goal up with an absolute perfect pass. With possession in his own defensive end, Beatty fired a perfectly weighted pass through the neutral zone right onto the stick of Williams as he entered the offensive zone for a breakaway, and Williams used a nice move and lifted the puck into the net to make it 1-1. Beyond North Attleboro’s first goal, the Tigers’ defense did a nice job of limiting chances for the Rocketeers. Oliver Ames boys hockey (2-2-1 Hockomock, 7-4-1 overall) hits the road on Saturday with a visit to Taunton at 2:00. North Attleboro (3-1-1, 5-5-1) is off until Monday when it takes on Foxboro at 6:00 at the Foxboro Sports Center.